The accessibility of the shop operation is a unique feature of Railtown 1897 State Historic Park. Most of the maintenance, repair, and train operations are on full view in the roundhouse. When a malfunction occurs, it can be an opportunity to demonstrate these activities. Working with historic equipment gives us lots of opportunities to demonstrate! Today, for example, it was a malfunctioning gauge that was giving us some grief. 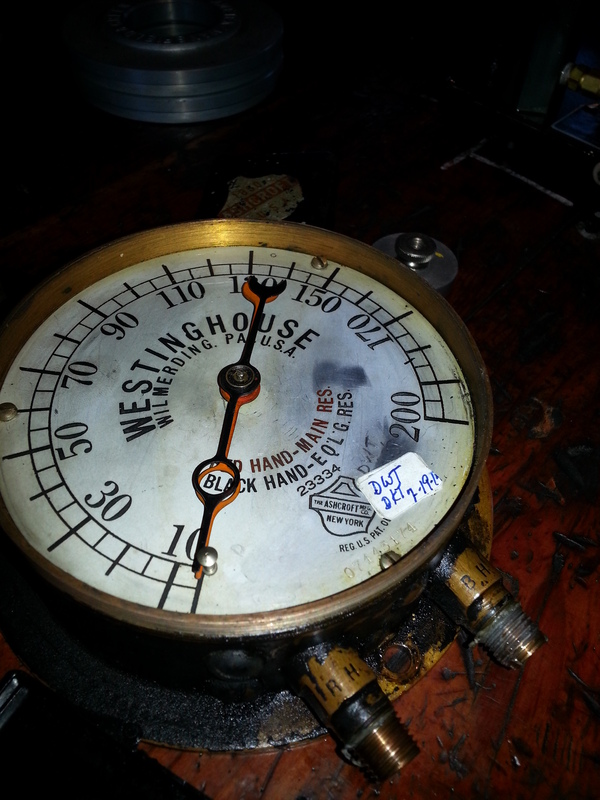 During hostling, the crew noticed that the gauge was reading 25 lbs, even when the air reservoirs were empty. Some troubleshooting led to the diagnosis of a misbehaving gauge. 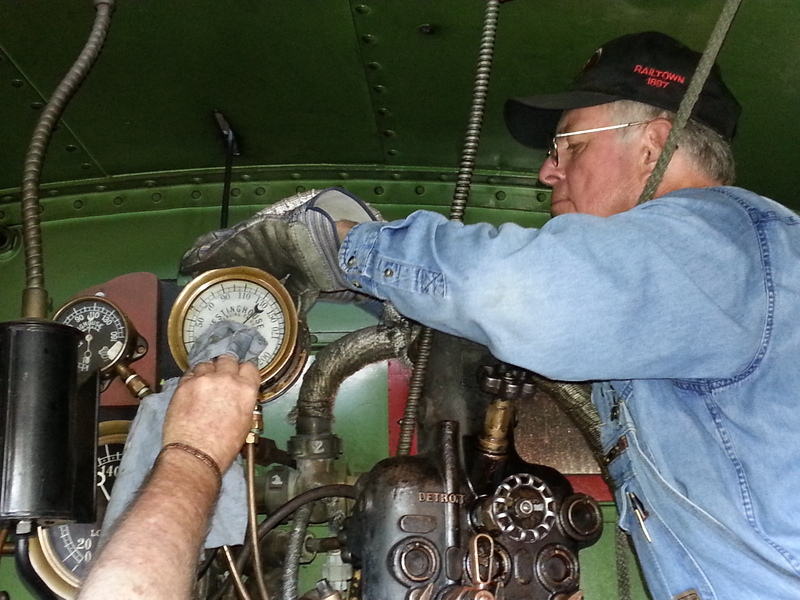 While most of the crew transitioned to a back-up diesel to keep the trains on schedule, David Ethier and Dave Tadlock worked to coordinate the repair. All of this work was done on public display, with a stream of visitors touring the roundhouse and the cab of the locomotive. Duplex air brake gauge- indicates two separate functions. The red hand indicates main reservoir pressure and the black hand indicates equalizing reservoir pressure. The sticker denotes the date of calibration. Step 3: Reinstall the gauge and give it a whirl! And the trains go on. So, sometimes it’s the little things, but they provide an opportunity to share some of the details of running an historic railroad. 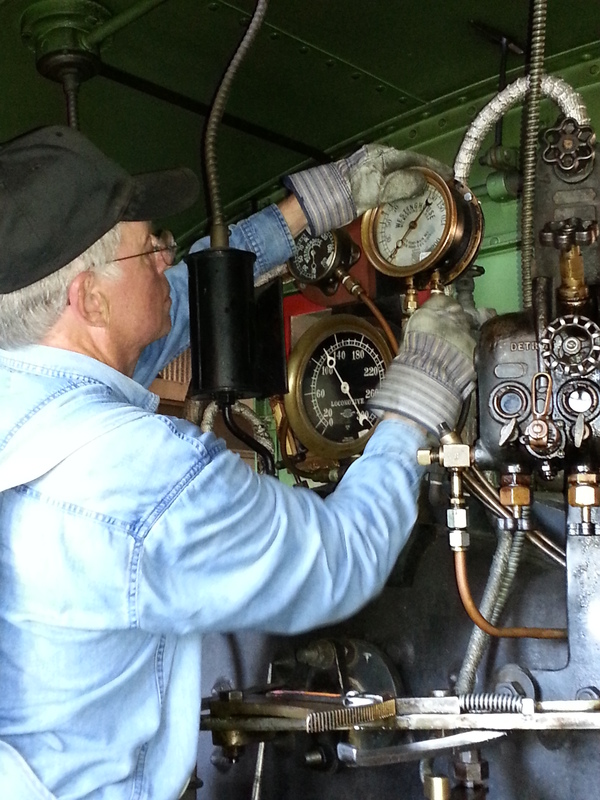 And if you were a visitor today, you were able to enjoy seeing two different locomotives in action, maintenance activities in the roundhouse, and tours of the cab of a steam locomotive while the repairs were occurring, all without missing a scheduled train. Almost makes you hope we’ll break something when you visit, doesn’t it? For a complete discussion of how Westinghouse air brakes work we suggest this article. 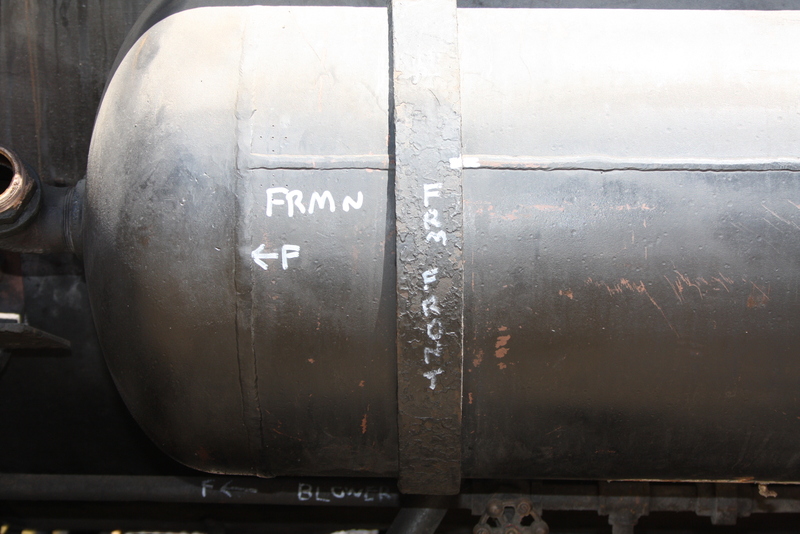 To start work on repairs to the locomotive’s boiler and firebox, we need to be able to access those areas. This means removal of a number of appliances, including the bell, sand dome, plumbing, jacket, lagging (cement and fiber insulation), and even the cab. Rear Headlamp from No. 28. Railtown 1897 Offers Behind-the-Scenes Shop Tours every Tuesday Morning! 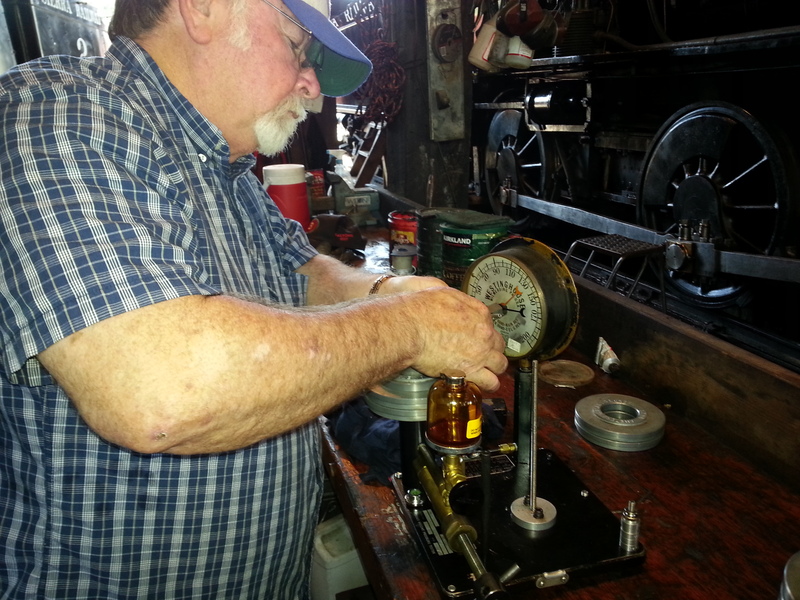 Railtown 1897 State Historic Park (SHP) will now offer special, behind-the-scenes Shop Tours on Tuesday mornings from 10 a.m. to noon on an ongoing basis beginning March 26, 2013. Interested visitors will be treated to an up-close and personal view of routine maintenance and specialized work happening on current projects in the historic Roundhouse as well as in the Tri-Dam shop (a Cold War-era machine shop used to repair, replace or service parts for operating equipment, cars, steam and diesel locomotives). 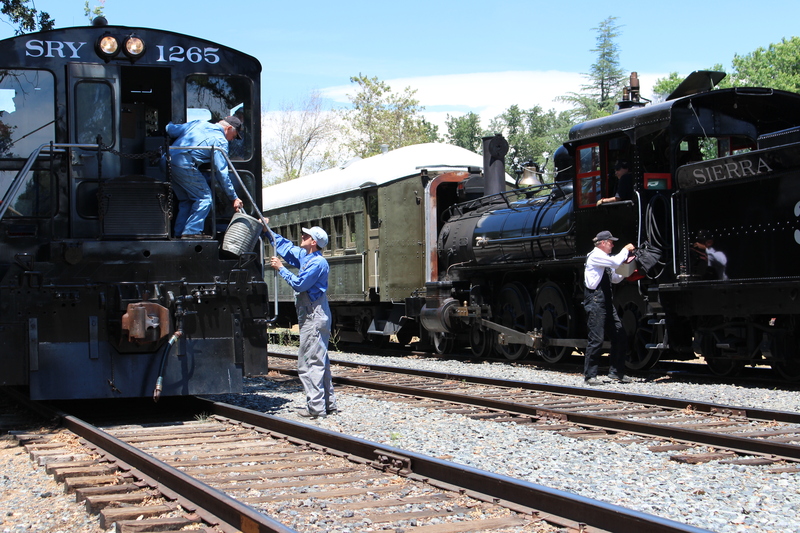 Keep in mind, parts for steam engines — and sometimes vintage diesel locomotives — cannot be purchased and must be manufactured on-site making Railtown 1897 SHP one of the most accessible places around to watch this specialized work being performed. 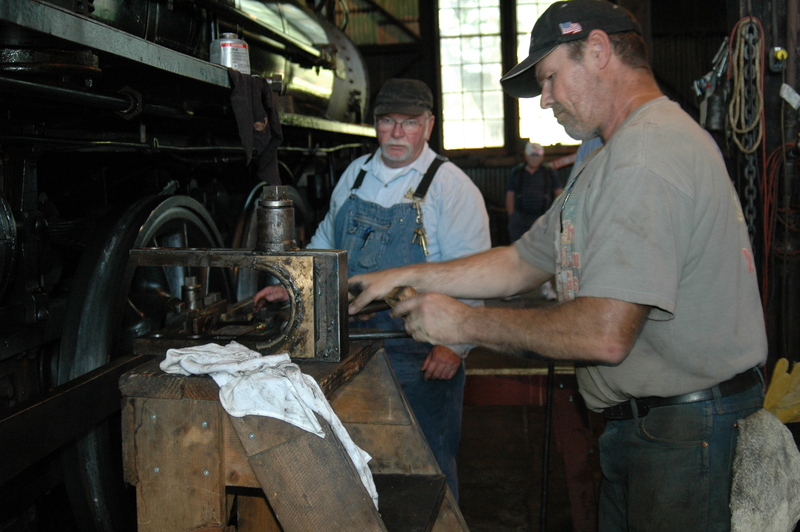 Along with educating visitors about our fascinating rail history, maintaining and repairing steam engines and diesels is an important part of the mission of Railtown 1897 SHP. The weekly two-hour Shop Tours begin with a brief slide show that provides background of current projects to date. After the video, a knowledgeable volunteer host will guide visitors to the historic shops to meet and ask questions of skilled paid and volunteer staff who are actively working on projects and activities that keep the historic shops alive. Open daily, Railtown 1897 SHP Shop Tours are included with Park admission, which is as follows: $5 for adults, $3 for youths ages 6-17 and free for children five and under. More information about the Shop Tours or Railtown 1897 SHP is available by calling 209-984-3953 or visiting http://www.railtown1897.org. This week, several coats of a high-tech epoxy-like paint (Ceramicoat) were applied to the interior of the water cistern, to prolong the life of the tank. The exterior was also treated with a primer. On Monday, the lid will be set in place, and then rivetting is planned for all day Tuesday, Wednesday and Thursday. Visitors on the behind the scenes tour may be able to observe some of the final 400 rivets as they are applied, depending on the schedule. It will be loud in the neighborhood! The new tender sporting a new coat of primer. 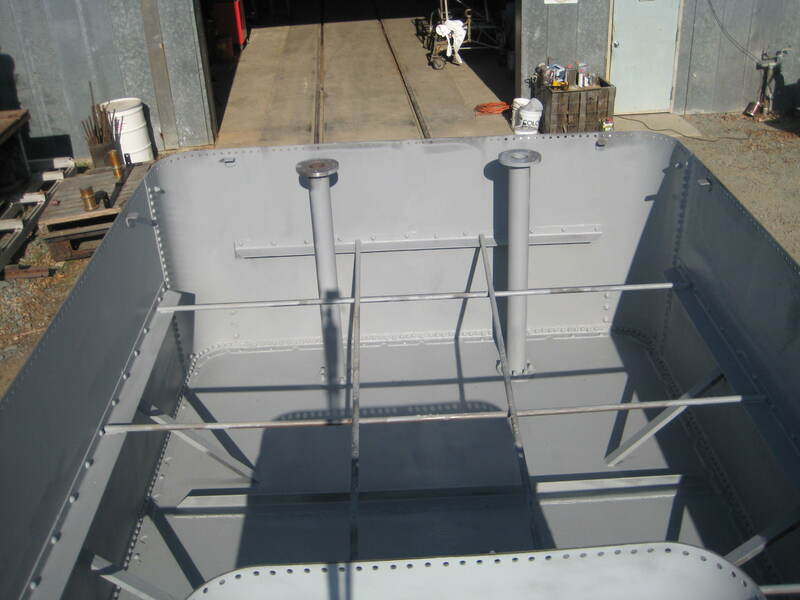 Interior of tender, with first coat of the "ceramicoat" lining applied. 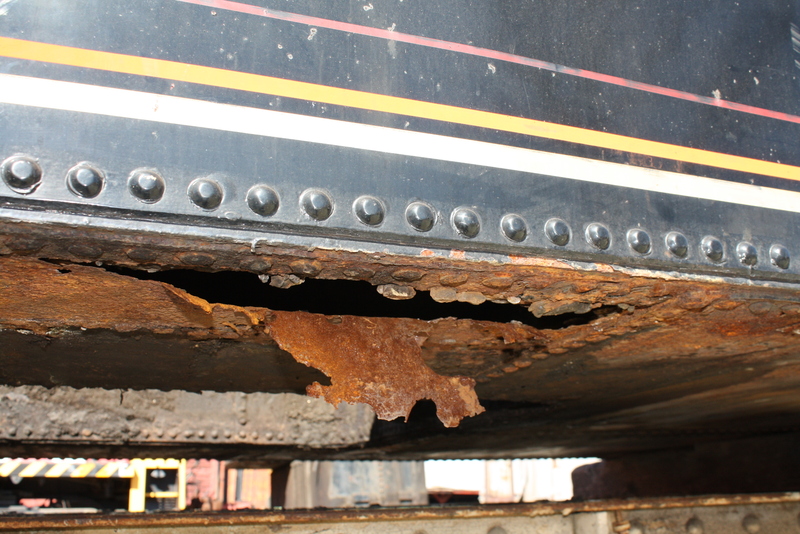 Damage to old tender, caused by years of corrosion. 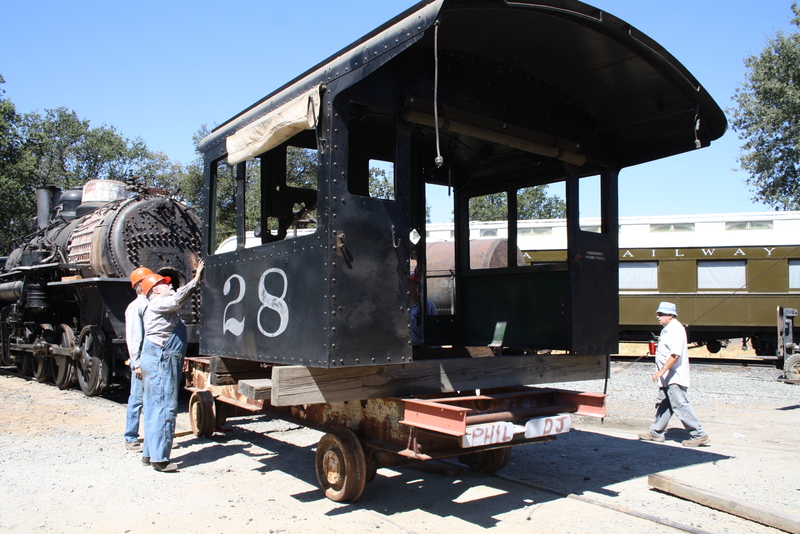 JAMESTOWN, Calif. – On two upcoming Wednesdays—November 11 and December 9—Railtown 1897 State Historic Park (SHP) will offer special, behind-the-scenes viewing opportunities for visitors to see the restoration progress of Sierra No. 3, known as the “Movie Star” steam locomotive for its many appearances in motion pictures and television shows. As part of the special viewings, Railtown staff will present a two-hour program which will also include a shop tour for visitors. Tours will consist of an overview of the project to date followed by a tour of the Tri Dam shop where much of the work is currently taking place. 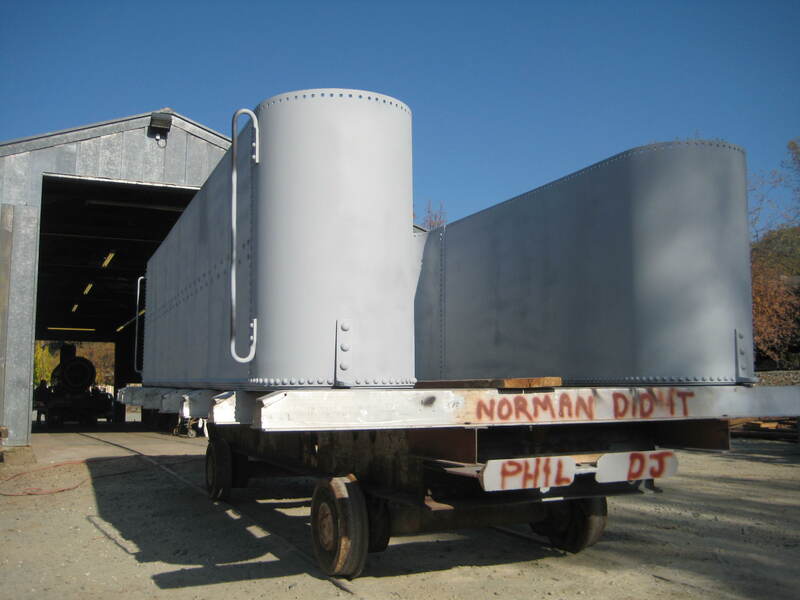 Restoration staff, utilizing a combination of historic and modern methods, is restoring this historic locomotive. Staff will be on hand to demonstrate the machinery and methods being used as well as to answer any questions. 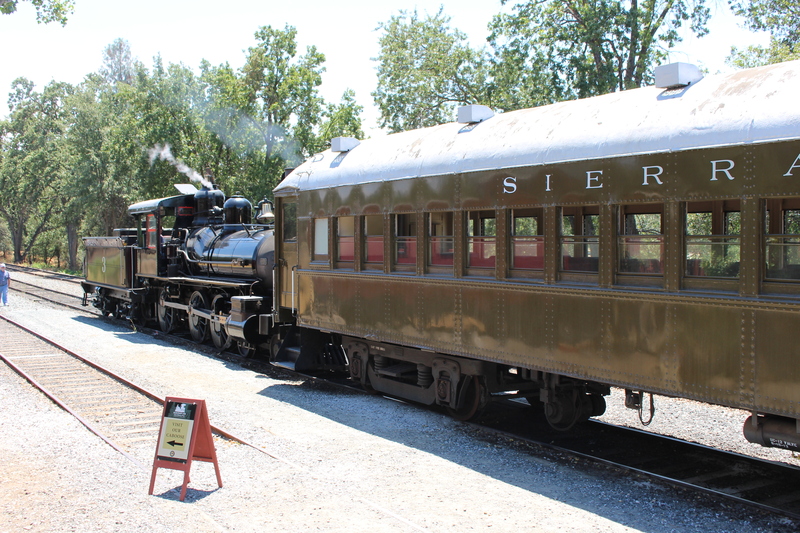 Built by the Rogers Locomotive Works in New Jersey in 1891, the Sierra No. 3 spent the early years of its life in Arizona, and was brought to Jamestown in 1897, where it saw over a century of use on the short line, hauling ore, lumber, marble and other goods out of the foothills. With the advent of diesels in the middle of the 20th century, many steam locomotives were destroyed for scrap, but Sierra No. 3 found a new career in the movie industry, appearing in more than 100 films and television shows over the years. 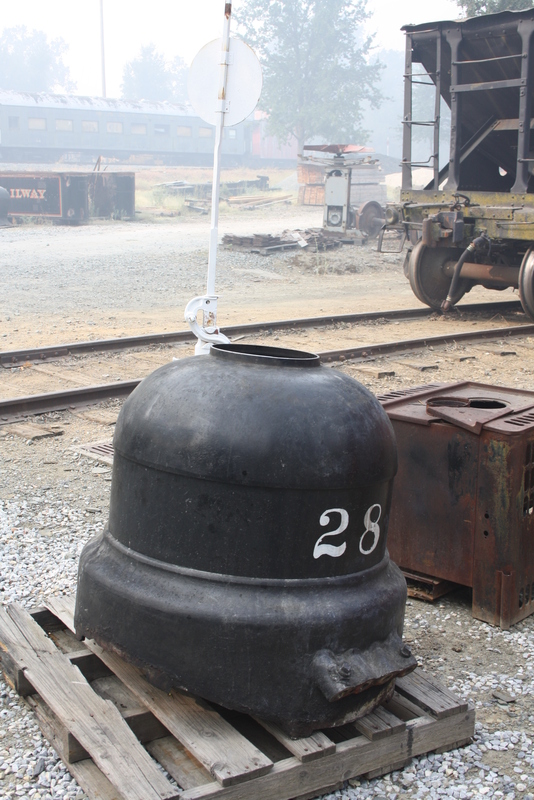 In September and October, the boiler erecting is occurring at the Sacramento Shops of the California State Railroad Museum. Once completed, the locomotive will be returned to Railtown for the completion of the project. This work is being funded by a California Cultural and Historical Endowment grant, the Sonora Area Foundation, the Irving J. Symons Foundation, the California State Railroad Museum Foundation and others. Cost for the special, behind-the-scenes shop tours is $5 for members and $10 for non-members and includes park admission. Advance reservations may be made by calling 209-984-3953. The popular Sierra No. 3 locomotive is expected to return to operation at Railtown1897 SHP in April of 2010.